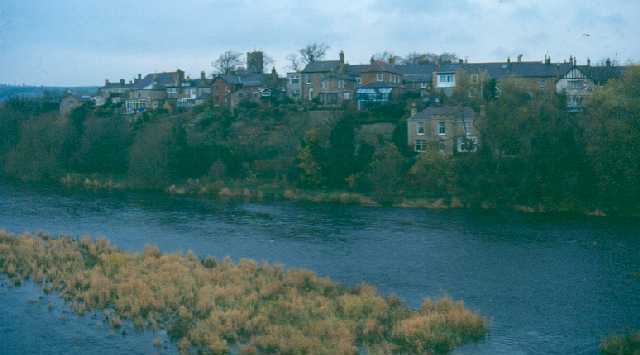 View of Corbridge from the south across the River Tyne. Photo by Northumberland County Council. The archaeology of the Corbridge parish is dominated by two settlements: namely the Roman garrison town of Corstopitum and the later, medieval town of Corbridge, located slightly further east. As with so many river valley towns, these settlements grew up at crossing points of the River Tyne. The river valley was also an important route along which communication and movement occurred from the earliest times and the relatively large number of prehistoric sites and finds around Corbridge would suggest that this was an attractive area to settle for thousands of years before Roman soldiers ever set foot on British soil. The earliest evidence for this cross-country route being used dates to Mesolithic times. Field walking and chance finds in the vicinity of Red House, Shorden Brae, Gallowhill and Caistron Field all help to build a picture of Mesolithic use. Excavations of the Roman town and fort from 1906 to 1914 tended to penetrate only as far as the latest Roman building and so the pre-Roman occupation of the site has not been thoroughly investigated. However, in 1952 a palisaded enclosure with the remains of a circular hut was recorded beneath the fort and, on the basis of other parallels, these have been dated to the Bronze Age. A hoard of bronze implements found at Farnley, and burials from near Aydon Fell House and Dilston Plains show widespread activity at this time. An unusual `coracle burial' was found in 1961 that may have contained Bronze Age pottery and a massive cup-marked sandstone block was found within the foundations of the fourth century workshops at Corstopitum, typical of carved rocks of Neolithic date. Taken collectively there are a significant number of sites dating to the Bronze Age in this area to suggest some sort of settlement. The numbers of Mesolithic flints found along the valley would also strongly suggest that the area was used repeatedly by as people travelled across the landscape. There is very little in between these two phases of occupation, suggesting that settlement here was still intermittent until Roman times. Around the Roman town of Corbridge, a number of small farmsteads or settlements existed in more rural locations. At Thornbrough Scar a settlement of six round houses dating to the second century AD has been excavated. Nearby at High Barns, another settlement, now partially destroyed by the main road, also appears to be Roman in date. These Roman sites and the Roman fort and town at Corbridge lie within a complex frontier zone of which Hadrian's Wall is the best-known element. Also in the vicinity are three Roman camps which lie 2km south-east of the Roman fort at Corbridge. The three camps lie very close to Dere Street, the principal Roman road between York and Scotland and their differing orientations reflect their subtle placing to exploit minor topographical features. Parts of Dere Street have been uncovered in the parish. Although the camps do not survive as upstanding earthworks they remain clearly visible on aerial photographs. A further possible temporary camp has been identified in the parkland of Howden Dene. The Roman station at Corbridge was established sometime after AD85 and it replaced an earlier fort at Beaufront Red House nearby. Evidence from the Vindolanda writing tablets now suggests that it may have been known as Coria at that time. When Hadrian's Wall was built to the north of the Stanegate across the Solway-Tyne gap, in the second century AD, forts like Corbridge in the hinterland behind the Wall became redundant. However, Corbridge also lay on Dere Street and guarded the main supply route north to Scotland, which ran from York to Corbridge and then up the North Tyne valley, eventually to Newstead. Thus when Antoninus Pius re-advanced into Scotland and a turf wall, known as the Antonine Wall, was constructed in AD142 on the Forth-Clyde line, Corbridge became a significant point on the supply lines of the new frontier and new fort buildings were constructed there. At the same time other forts on Dere Street were re-commissioned and the road was fitted with milestones. Corbridge's location at a crossing point on the Tyne and at the junction of two of the principal Roman roads, the Stanegate and Dere Street, meant that it retained its strategic importance despite subsequent changes to the frontier. The military vicus was enclosed within defences and two separate enclosed compounds were built in the centre of Corbridge in the third century for the manufacture of arms and equipment for the army. A significant civilian settlement grew up around the military site and extends well beyond the area where remains are visible. By the mid-second century it was a defended market town and continued to be occupied until the late fifth century at least. The remains of a Roman bridge that carried Dere Street over the Tyne can still be seen in the bed of the river immediately to the south of the Roman town. Close to the bridge, the remains of an Anglo-Saxon watermill were excavated in 1995. However, the relationship between the collapse of the Roman infrastructure and the post-Roman settlement is not at all clearly understood. The traditional view is that after the Roman town was abandoned a new early medieval settlement was established nearby, on a hill to the east, with the Roman town being used as a quarry for building stone for the new village. The true sequence is probably less clear cut and, despite the removal of deposits which may relate to this period and the fact that excavations have focused strongly on the military functions of the Roman site, Anglo-Saxon material has been recovered from the site of the Roman town. This consists of two brooches found with 32 glass beads, a small vessel found near a cist, a sword scabbard mount, and two skeletons, none dating to before AD700. Other objects found from the area under the car park at the site of the Roman fort, have a probable date of the later fifth to early sixth century. Bloody Acres is reputedly the site of an Anglo-Saxon battle, possibly fought in AD914. These various pieces of fragmentary evidence are sufficient to indicate that the site of the Roman town was used in the post-Roman period, although further research could profitably be carried out into this era in Corbridge. In AD786, Alduf was consecrated Bishop of Mayo in what was referred to at that time as the monastery at Corbridge. The Church of St Andrew in Corbridge is certainly partly Anglo-Saxon and the tower of the church is the only pre-Conquest standing building in Corbridge. Certain architectural features and the dedication to St Andrew, suggest that the original foundation may have been in the late seventh century as there are similarities with other late seventh century churches at Jarrow and Monkwearmouth. The reference to the church being a monastery is not supported either by the architecture visible today, nor by excavations in the 19th century. Corbridge was already a borough when Henry II came to the throne in 1154 and in 1201 King John granted Corbridge the status of a royal borough. Its location at the junction of two ancient highways made Corbridge a natural point where a commercial centre should develop through trade and a market place. Corbridge remained at the junction of two major routes for many centuries and became the destination of new roads as it again became a bridging point across the Tyne. The main east-west road, the Carelgate, was used until the 18th century and carried traffic between Newcastle and Carlisle via Corbridge and Hexham. Dere Street, which later became known as Watling Street, continued in use through the 12th to the 16th centuries and was a conspicuous feature, which served as a boundary for every neighbouring estate. It was converted to a turnpike in 1800 but became less important after the construction of the Great North Road. The discovery of lead in the North Pennines also led to the creation of other packhorse routes leading to and from Alston, Stanhope and Penrith. The remains of a small 14th century stone bridge on one of these routes can still be seen on the west bank of the Devil's Water. Linked with the discovery of lead and silver, a mint was created at Corbridge and Carlisle. The importance of Corbridge as a crossing point on the Tyne was ensured after the old disused Roman bridge was replaced by a new structure in 1235. This stood on the site of the present bridge, which was built in 1674 and was the only bridge on the Tyne to withstand the floods of 1771. In the 13th century the town was at its most prosperous and had become the second largest borough town in the region, next to Newcastle. However, partly as a result of repeated destruction during the Border Wars at the beginning of the 14th century and population decline after 1349 when the Black Plague took its toll, the town's prosperity declined considerably. Dwellings on individual plots were rebuilt a number of times during this period of unrest. In 1296 a Scottish invasion led to destruction both at Hexham and Corbridge, which was burnt during this raid, reportedly suffering almost total destruction. The burgesses were given a gift from the king of 40 oaks to rebuild their houses. There is also evidence of a number of other buildings, now lost. The earliest documentary reference to the Chapel of St Helen occurs in about 1300, when a deed mentions a St Helen's Street. This chapel was built to serve the manorial hall, which was located close by. Despite excavations in the area, the remains of both buildings have failed to materialise, although a boundary wall does contain some medieval fabric. To the south of the Church of St Andrew there is another significant medieval building, the Vicar's Pele Tower. The tower is mentioned as the vicar's property in a list of fortresses drawn up for Henry V in 1415. There is no record of its erection, but it is built in a style of about 1300 and is all of one date. Further medieval buildings in Corbridge include Low Hall, also known as Baxter's Tower, which is thought to be the oldest house in the village apart from the Vicar's Pele. The nucleus of the building is a medieval tower, three stories high, yet it retains many of its original features including a vaulted ground floor. Recent interpretations have suggested a 13th century house stood on the site before the tower was built in the 15th century. During the medieval period a little hamlet or suburb grew up on the priory lands around the prior's manor house and Trinity Church, now the area known as Trinity Terrace. It lay outside the ditch that formed the defence and limit of the town. Burials associated with Trinity Church have been found in Trinity Terrace on a number of occasions. It was probably during the 13 or 14th century that the street pattern that we see in the centre of the town was first established. At the centre of the town was, and is, the Market Place where markets were held weekly since the reign of King John at the beginning of the 13th century. The Old Market Cross is now set against the churchyard wall 2m east of the Vicar's Pele; it is a combination of Roman, 13th century and 18th century build. Outside the town, investment in defensive buildings to provide protection from border conflict was taking place at Aydon Castle in the 13th century. The castle started life as a fortified manor house with the earliest buildings being timber-framed. They were replaced with stone buildings in the more troublesome times of the late 13th century, but in the Scottish wars of the early 14th century, Aydon was the first place to be attacked. In response to this, fortifications were improved and battlemented walls provided. The rural hinterland of Corbridge contained a number of small farming villages, few of which have survived to the present day. Aydon itself once held two settlements, but only one remains today. Other deserted medieval villages once existed at Shildon, Portgate with a fortified tower, Dilston and Thornbrough. The hamlet of Spredden was attacked by the Scots in 1391 and today the exact location of this settlement lost, but may be some earthworks close to High Barns. We know from documentary sources that many of these villages existed in the 12th century, but presumably border unrest, plague and agricultural improvements, ensured that they could not survive in any substantial form today. Iron working, an important activity in the Roman town, appears to have continued to play a role in the economy of medieval Corbridge. Four new forges were entered in to the Provost's account of 1525 and ironwork was known to be a principal commodity sold at Stagshaw Fair, with lists of purchases from the fair in 1298 and 1299 including horseshoes, nails and ironware. Main Street in Corbridge was formerly called Smithgate because of the numbers of iron working shops that were located there. The medieval street name Hidemarket suggests a tanning industry and brick-lined tan-pits are said to have been found nearby in about 1760. The market, along with many others, had disappeared before 1663 and the town had declined virtually to the status of a village in the late 16th century. Despite the end of hostilities with Scotland, Corbridge did not really grow until after the opening of the Newcastle to Carlisle Railway in 1835, when the town expanded a little on the south bank of the river and the historic core of the town on the north bank became a little more built up. Throughout the 18th and 19th centuries new building in the town continued to replace and adapt existing properties and it is at this time that the architectural character of Corbridge that we are familiar with today, was formed. For example, Monks Holme located at the eastern end of Main Street, is one of the finest old houses left in Corbridge, possibly dating to the 16th or 17th century with much 19th century restoration. Nearby is Byethorne House, originally called 'The Willows', with 20 acres of gardens, parkland and woodland overlooking the River Tyne. Hill Street was built up by the 18th century and many of the buildings on this street date to between 1700 and 1800 and are now listed buildings, for example 14 and 16 Hill Street and 18 Hill Street, also known as Heron House. A former chapel is now used as a library and tourist information office at the corner of Hill Street and Princes Street. It was designed by F Emily who, in 1887, also designed the Town Hall with shops beneath which stands on Princes Street. The former Primitive Methodist Chapel in Corbridge dates from 1867. A town located at the meeting of several roads requires a number of inns for the traveller. Corbridge had quite a few and a number of these buildings are still standing today. The Angel Inn is a 17th century inn that was extended in the 18th century. It was formerly called the King's Head and from 1752 until the opening of the railway it was the posting inn for Corbridge. The Wheatsheaf Inn is a mid-18th century inn that was altered and enlarged in the mid 19th century. The Black Bull Inn in Middle Street, dates to 1765 and 1755, but incorporates earlier fabric and was a separate house until about 1670. The Golden Lion Public House is a mid-18th century inn, which was built with materials from Dilston Hall in 1768. The Boots and Shoes Inn, now demolished was another posting inn which was located in Water Road (now Front Street) and its name derived from the local industry of shoemaking. The principal industries carried on in the town during the first half of the 19th century were shoemaking, lime burning and market gardening. The shoes were made for the coal and lead miners of the area and many were exported to Shields and became known as Shields shoes. Numerous orchards were planted about the town in the 19th century, although they ceased to be profitable. The traditional iron working also continued in the town, with five smiths recorded in 1855. It is likely that some local street names were developed from this industry, such as Filers Row, located at the Market Place end of Middle Street. Corbridge Pottery in Milkwell Lane was established in about 1840. Two impressive early 19th century bottle ovens are the most prominent feature here and there is also a pair of 'Newcastle' horizontal kilns. The pottery closed in about 1910. Lime, mainly for agricultural improvements was created at a number of lime kilns in the surrounding countryside, such as Thornbrough and Aydon Quarry. A paper mill was established south of the town at Dilston. The archaeological interest of the area carries on up to more modern times. The lychgate of St Andrew's Church in Corbridge was built in 1919 as a World War I memorial.